BIOSTAR is proud to announce the release of the latest motherboard intended for people pursuining cryptocurrency mining. 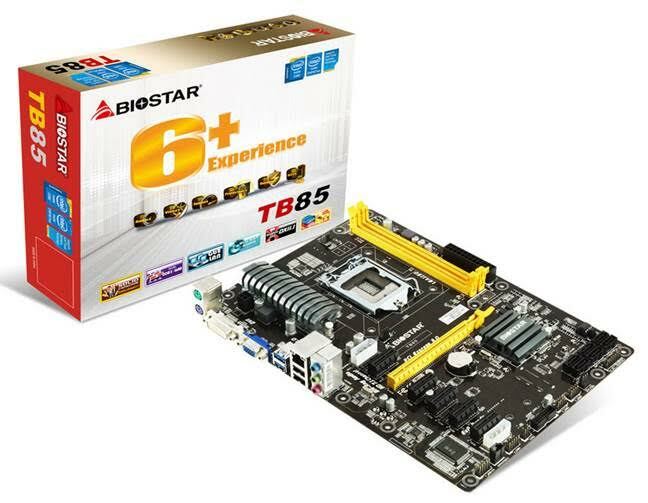 The new BIOSTAR TB85 motherboard features multiple expansion slots to allow usage of multiple cards simultaneous for maximum efficiency for cryptocurrency mining.The board supports Intel 1150 processors and features the B85 chipset. The MSRP for the BIOSTAR TB85 motherboard is $69.99 giving it a quick and high ROI. The BIOSTAR TB85 supports 4th-generation Intel processors and allows home users, gamers and businesses to take advantage of its wide feature set for work or play. Support for Intel Rapid Storage Technology (Intel RST) for fast boot-ups and application load times, and Intel Small Business Advantage (Intel SBA), which delivers business-centric security protection, such as after-hours virus scans and data backup, and blocks recognition of unwanted USB drives. With up to 6 PCI-e slots, you can maximize this motherboard for cryptocurrency mining and earn back your investment quickly. The BIOSTAR TB85 is made to last featuring X.D.C. solid capacitors with a VRM heatsink installed for more efficient cooling of the motherboard components. The board features Intel Small Business Advantage allowing users to monitor the status of their motherboard as well other security features to protect their mining investment. Specialized circuit design detects overvoltage and surges to your BIOSTAR motherboard and actively cuts off overvoltage supply to protect your system.Over-current protects your motherboard from damage when high-current is detected. Heat protection adds another layer of protection by detecting high heat from the motherboard and CPU to avoid burn damage. This motherboard features exclusive BIOSTAR 6+ Experience feature set which delivers the best BIOSTAR has to offer: Speed+, Audio+, Video+, Durable+, Protection+ and DIY+.